This powerful, iridescent painting prefigures a series of Prismatic paintings Nicholson created in her final years, in which the fiery orange edge and separation of colours in the large rainbow arc, are characteristic. While studying at the Byam Shaw School of Art in London, Winifred was captivated by the mother-of-pearl of a shell: ‘I was seeing colours in the iridescence that he did not see – and have been seeing them ever since, or attempting to, because colours hide, they will only show themselves under the right conditions, and only to certain eyes at certain times.’Another breakthrough occurred travelling with her father in India, Ceylon and Burma after the First World War, during which she ‘noticed how eastern art uses lilac to create sunlight.’ Shortly after their return, Winifred met Ben Nicholson and they married soon after. Between 1920 and 1923, the artists spent their winters in Lugano, Switzerland, spending time in Paris absorbing new developments on the way. The theme of flowers on a windowsill before a landscape began at this time and would have lasting significance throughout her career. A National Treasure, Lord Richard Attenborough (1923-2014) made his name as one of Britain’s leading actors on stage and screen before forging a career as a film director, his career spanning six decades. The son of a Cambridge don and later Principal of University College Leicester, Frederick Attenborough and his wife Mary, a writer and campaigner for women’s rights as well as Basque and German refugees. Richard, the elder brother of naturalist and broadcaster Sir David Attenborough, was educated at Wyggeston Grammar School in Leicester where he gained a scholarship to RADA in 1940. As a student he starred in the 1942 film In Which We Serve (during the war he served in the Royal Air Force), as gangster Pinkie Brown in Brighton Rock, 1947 and in the all-star cast of The Great Escape in 1963. His later roles included Steven Spielberg’s blockbuster Jurassic Park, Miracle on 34th Street and Elizabeth in the 1990s. Attenborough won Oscars for his direction and production of Gandhi in 1983. He also directed “Oh! What a Lovely War”, 1969, A Bridge Too Far, 1977, Cry Freedom, 1987, Chaplin, 1992 and Shadowlands, 1993. On stage, Attenborough appeared with his wife Shelia (nee Sim), whom he married in 1945 and met at RADA, in the original production of Agatha Christie’s The Mousetrap in 1952. He was made a Commander of the British Empire in 1967, knighted in 1976 and made a life peer in 1993. The Chairman of various organisations including Chanel Four Television, Capital Radio and RADA, as well as President of BAFTA, the British Screen Advisory Council and the National Film and Television School, Attenborough was also renowned for his philanthropic endeavours, presiding over the Gandhi Foundation, the Actor’s Charitable Trust as well as being a Goodwill ambassador for Unicef. A painter of colourful, lively figurative paintings, still lives and landscapes, Winifred Nicholson was a quintessentially British painter. After studying at the Byam Shaw School of Art in London she first exhibited at the Royal Academy in 1914 under her maiden name Winifred Roberts, she then travelled extensively studying in Paris, Lugano and India. In 1920 she met and married Ben Nicholson, the son of the distinguished artist, Sir William Nicholson and she continued to exhibit widely both on her own and with her husband. A member of the Seven and Five Society and the New English Art Club she also exhibited abstract works under the name Winifred Dacre at the London Gallery in 1937. In 1931 she separated from Ben Nicholson and moved to Paris where she lived until 1938 when she returned to live at Brampton in Cumbria near Hadrian’s Wall. 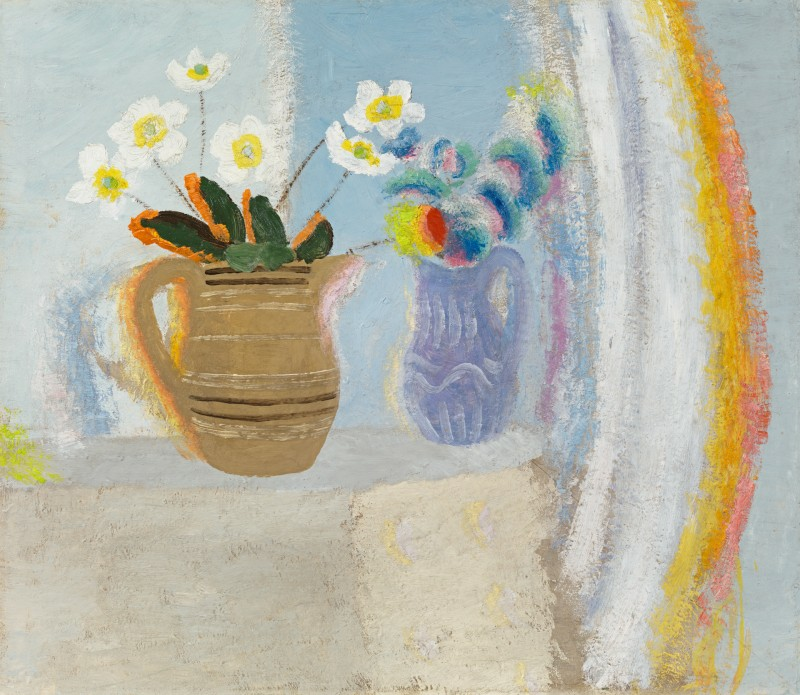 Works by Winifred Nicholson can be seen in many public collections including Tate Britain. Best known for her vibrant flower paintings she once wrote ‘when one is young one is satisfied with a flower petal or a sparkle. Now I want more. I want the rainbow scale of the flower and the reason and the travel of the sparkle’. Winifred Nicholson, ‘Three Kinds of Artists’, Unknown Colour, ed. Andrew Nicholson, Faber & Faber, London, 1987, p. 239. The artist cited in Jovan Nicholson, 2016, ibid. p. 12. The artist, ibid., p. 12. Sir Norman Reid, ‘Foreword’, Unknown Colour: Paintings, Letters, Writings by Winifred Nicholson, Faber and Faber, London, 1987, p. 6. Christopher Neve, ‘The Points of View of Winifred Nicholson’, 1979 cited in Unknown Colour, op. cit., p. 18.